a) Part of an important Protopalatial building of the MM IIA period which included three column bases. c) Architectural remains of houses of the same period which indicate the great extension of the Neopalatial settlement lying. Excavation in a plot on the north slope of Petras-Kephala (Hill II). The excavation began in 2004, under the direction of Dr Metaxia Tsipopoulou and the participation of the archaeologist Dr Yiannis Papadatos, and it continued in 2005 on the higher terrace. 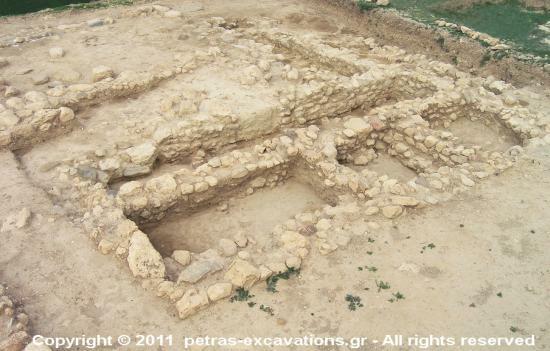 a) The excavation of the MM IB-IIA House Tomb 2 with seven rooms was completed. b) The excavation of EMIII-MMI House Tomb 1 continued, but it was not finished. c) EM I architectural remains were revealed at the south edge of the terrace. They belong to the settlement which belongs to the adjacent plot. Powered by Free and Open Source Software.